Working parents see the weekend as opportunity to make up for their absence from home, Weekend activities can serve as a rejuvenating break from your weekday routine, helping you to diffuse work place stress and also bond with your family. 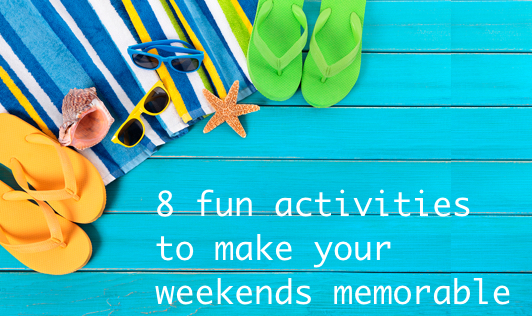 Here are a few tips that can make your weekends memorable and stress free. Get to know your child’s friends: Invite your kid’s friends and their families over for a party or a sleepover. This could be a fun way of getting to know them better. Spruce up your surrounding area: Children are always enthusiastic to help in fun outdoor chores. So, let them do their bit in decking up the pavement, collecting debris, or simply rearranging pebbles in the area around your house. Photo album: Why not dress like the way you do for party and have shots clicked by you and your kids? Selfies, portraits, or group clicks can help you capture beautiful moments. Try new shots and poses so that you can have more fun. Camping out: A beautiful location with a nice option for camping out can make the weekend amazing and give you the much-needed respite from work. If camping out is not an option, try a night out at friend’s place. Eating out: The list is definitely incomplete without mentioning this weekend activity. Give it a different twist by visiting theme restaurants or experimenting with a new cuisine. Visit to an amusement park or sightseeing: Either of these amazing options can be considered when you are looking for day long fun. Planning plays a key role and allows you to explore your sporty side to the fullest. If you are living in city known for its tourist attractions, this certainly hits the number 1 spot for a weekend fun idea. Engage your child in a hobby: How about encouraging your child to paint or learn music? You are actually giving your child a new skill in the form of a hobby. Spa visit: This option works great for your growing girl. A visit to the spa is guaranteed to help you bond better, spend quality time together, and, not to forget, look better. Some may get overwhelmed and may pressurize themselves to plan creative and unusual activities for the weekend but in turn may end up getting tensed and dissatisfied dissolving the whole purpose of weekend activities. So, focus on planning activities that are feasible and that help you to ward off your stress and connect with your family.